I wanted my students to explain a recipe in class but first, I did a demonstration. 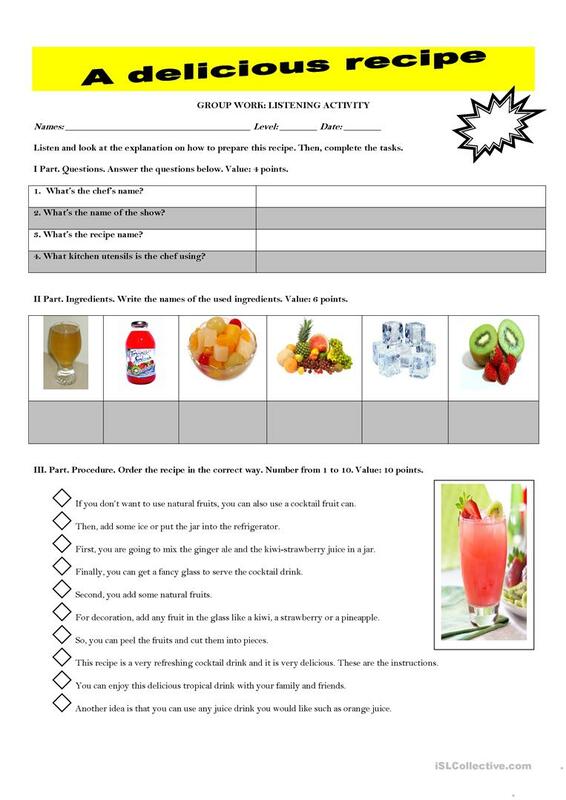 So, this worksheet complements the task where as a teacher I started acting out and explaining a recipe. Then, they will solve the tasks (questions and ingredients names). Finally, they will order the recipe. The above downloadable worksheet is recommended for business/professional students, high school students and elementary school students at Elementary (A1), Pre-intermediate (A2), Intermediate (B1), Upper-intermediate (B2), Advanced (C1) and Proficient (C2) level. It is valuable for revising Verbs: Action verbs in English, and can be used for strengthening your class' Listening, Spelling, Speaking, Reading and Writing skills. It is focused on the topic and words of Food.